Even in the best of circumstances, parenting is a challenge. When you throw a divorce or separation into the mix, parenting becomes even more complex. Emotions of anger, betrayal, or loss can cloud judgement and lead to conflict. Thus, it’s important to remember that co-parenting isn’t a contest and the responsibilities that come with successfully raising a child should surpass any issues stemming from divorce. Exceptional co-parenting requires flexibility, teamwork, respectful communication, accountability, and dedication. When parents cooperate parenting becomes less stressful and far more effective. Your child’s future lies in your hands, which is why it’s important to plan out your co-parenting relationship and get things right. The Law Office of Richard Renkin & Associates have compiled a number of helpful resources for California co-parents. The extensive list includes everything from helpful apps to information on creating visitation schedules and decision making guidelines. As you begin your venture into co-parenting, it’s always best to start with the basics. The following articles offer helpful insights for new co-parents. Topics range from general do’s and don’ts to commandments every co-parent should abide by. The Do’s & Don’ts Of Co-Parenting Well: Co-parenting is no walk in the park, but it can be a little easier to manage if you follow a few do’s and don’ts. Psychologist, Deborah Serani, outlines several do’s and don’ts for co-parents to abide by. 11 Successful Co-Parenting Commandments: Looking to set your co-parenting venture off on the right foot? The 11 co-parenting commandments will help you ensure things run as smoothly as possible between you and your ex. The San Diego County Co-Parenting Guide: Theco-parenting guide includes a list of counseling and family services compiled by the San Diego Superior Court..
How To Help Your Child Through A Divorce: Divorce is never easy on children and your child may experience a spectrum of emotions ranging from sadness to anger. KidsHealth provides an in-depth article on how to handle your children’s reactions and help them cope with divorce. Mobile tech plays a pivotal role in our daily lives. There are a range of mobile apps to make just about any aspect of daily life easier. Thankfully, co-parenting is no exception. There are a number of great apps that help with communication, scheduling, budgeting, meal planning, and more for separated parents. AppClose: AppClose is a free co-parenting app that comes with many of the bells and whistles paid apps provide. You can coordinate a shared calendar, send and receive secure messages, track expenses, and request or send payment for expenses. Google Calendar: Google Calendar will help you coordinate your child’s schedule with your ex. You can create a shared calendar with your ex to schedule weekly visits, events, and special activities. If your ex has editing rights, you can collaborate on creating the schedule together. Google Calendar is one of the best ways to ensure you’re both on the same page when it comes to your child’s schedule. Cozi: Cozi is a free family organizer that incorporates scheduling like Google Calendar, but also offers users the ability to create shared shopping lists, meal plans, to-do lists, a family journal and more. Cozi takes things a step further by allowing you to coordinate more of your child’s day-to-day life so that the living experience is consistent between both homes. Divorce can have a large impact on children. The family journal will allow you and your ex to share observances on your child’s health. Our Family Wizard: Our Family Wizard is designed specifically for co-parents. Judges in over 45 U.S. states actually order families to use the app in certain high-conflict child custody disputes. Our family wizard offers color-coded child custody calendars, secure messaging, family journaling, and a shared parenting expense log. The app costs $99 per year for each parent. Coparently: Coparently offers many of the same features as Our Family Wizard. The app provides color-coded scheduling, secure messaging, a shared expense journal, and an emergency contact directory. Like Our Family Wizard, the app costs $99 per year for each parent. Talking Parents: Talking Parents is a messaging app designed for record keeping. In the event you need to supply proof of correspondence to the court, you’ll be able to download a record of all of your communication. Third party record keeping ensures your ex is never able to delet or edit a message. The app itself is free, but having the ability to download communication records costs $3.99 per download or $4.99 per month. The number of divorce and co-parenting books in existence can be overwhelming to sift through. It’s easy to suffer from choice overload when trying to find good reading material. Luckily, we’ve outlined some of the best co-parenting books to date for both parents and children. Mom’s House, Dad’s House: Mom’s House, Dad’s House is written by internationally renowned therapist, Isolina Ricci. The book has become a go-to read for divorced parents and includes helpful guidelines, checklists, tools, and self-tests. The Co-Parents’ Handbook: Divorce will never break your child’s heart if co-parenting is approached properly. The Co-Parents’ Handbook offers tested approaches to parenting after divorce. The book successfully answers many important questions that come with co-parenting and offers a number of helpful strategies. Co-Parenting With A Toxic Ex: What do you do when your ex tries to turn your children against you? Co-Parenting With A Toxic Ex explores strategies to avoid parental alienation syndrome and ways to deal with a hostile ex-spouse. Co-Parenting Survival Guide: Ensuring your child’s health and happiness can be difficult when parenting communication is hostile and conflictive. Co-Parenting Survival Guide walks readers through strategies to avoid hot spots of hostility and conflict surrounding co-parenting. It’s Not Your Fault, Koko Bear: It’s easy for a child to believe that they may have been responsible for a divorce. It’s Not Your Fault, Koko Bear will not only help children to understand that the divorce wasn’t their fault, but will also help them explore what divorce means and how things will change in a easy-to-understand way. Dinosaurs Divorce: Dinosaurs divorce explains divorce through the digestible lense of a dinosaur family. The book will help children understand why parents divorce, what having two homes will be like, and what it could be like to live with stepparents and stepbrothers/ stepsisters. Divorce Is Not The End Of The World: At the time of separation, divorce may feel like the world is ending. However, divorce is really the beginning of a new chapter in life. Divorce Is Not The End Of The World helps children cope with their feelings, changing environments, and the introduction into blended families. I Don’t Want To Talk About It: When going through a divorce your children may not want to talk about their feelings or the events unfolding. I Don’t Want To Talk About It illustrates the range of emotions a young child may feel when confronted with a family divorce. No longer being able to be with your child at all times is a hard reality to accept. Moreover, it can be just as stressful for your child to no longer have both parents around. Where will your child reside throughout the week and which parent gets what holidays? It’s important that the schedule you and your ex-spouse put in place can support your child’s developmental and emotional needs. Well-planned residential and holiday schedules can reduce anxiety, stress, and and feelings of isolation for everyone involved. Successful Residential & Visitation Schedules: Dr. Emery has dedicated his life to researching family relationships and children’s health. In this post, Dr. Emery shares research-backed child custody schedules broken down by age group and hostility level between parents. Common Holiday Custody Arrangements: Deciding who gets the children for what holidays is no easy task. Custody X Change shares a few common methods co-parents use to decide custody during holidays. Holiday Tips For Blended & Divorced Families: Holidays can be tricky when family dynamics change. Traditions, values, and the time spent with each parent all change. The article by Lemon Lime Adventures discusses tips co-parents can use to ensure the holidays remain special for their children. Communication and decision making are by far the hardest aspects of a co-parenting relationship to iron out. It can’t be re-iterated enough that co-parenting is a team effort. Both parents need to be on board for any and all parenting decisions made. There are a number of great articles that walk co-parents through a number of different decision making and communication techniques and tips. Decision Making Options For Divorced Parents: Family therapist, Dr. Tim Hartnett, discusses proven decision making models parents can use to effectively raise children while avoiding conflicts over parenting decisions. Co-Parenting Discipline Handovers – Who Gets To Call The Shots? : How do you deal punishments that extend beyond the time with your child? Can you expect your ex to uphold your punishment? Internationally recognized divorce coach, Christina McGhee, discusses ways parents can handle discipline handovers. 9 Discipline Mistakes Divorced Parents Often Make: As you begin your venture into co-parenting it’s worth reading up on mistakes other parents have made to avoid making the same mistakes yourself. The article covers the nine most common discipline mistakes co-parents make. Successful Co-Parenting Communication After Divorce: Communication is often a crippling issue post-divorce and not just between parents. Communication with your children can also break down. The article by Divorce Magazine discusses how to keep the lines of communication strong between all members of the family. There are a number of additional co-parenting considerations that you may have to grapple with. For instance, how do you manage relationships with your former in-laws and what happens if you decide to move your child out of state? The following articles are worth reading if any of those questions crossed your mind. Moving Your Child Out Of California: It’s not uncommon for a parent to want to move after a divorce. A newly divorced individual may want to be closer to family for emotional support or may no longer be able to afford living in the current city. 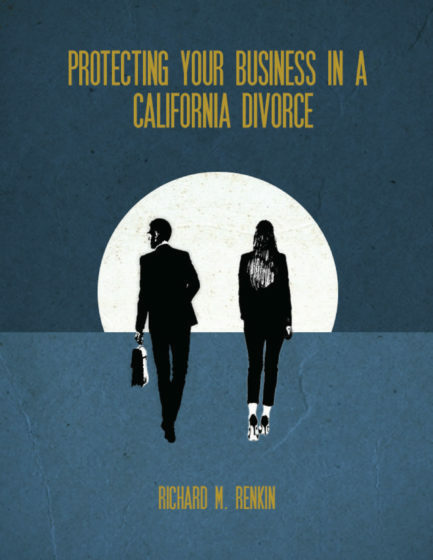 The article by DivorceNet discusses California’s laws regarding move away cases and what courts consider when making a decision. Dealing With Former In-Laws: A lot of energy in a divorce goes into protecting the children, but it’s important to remember that your children won’t be the only ones affected by your divorce. Your former in-laws will likely still want to a play a role in your child’s life. The article from Dummies discusses how to maintain relationships and build stability with former in-laws after a divorce. Disputes revolving around co-parenting issues can be difficult to resolve alone. Family law attorney, Richard Renkin, has helped parents across Southern California solve issues regarding child custody, visitation, child support, and more. Mr. Renkin is also a trained mediator in addition to being a lawyer. Mr. Renkin can help your family settle disputes through the process of mediation. For further advice or support, contact the Law Office of Renkin & Associates today. The firm has two offices conveniently located in Encinitas and Downtown San Diego. Call our office at (888)837-3564, or email us to schedule an initial consultation.